Successful content marketing means producing relevant and interesting content on a consistent basis—content that can attract the right audience to your site. It also means consistent and effective content promotion . Nelio Content promises to automate or assist with many of these tasks—all from within WordPress without the need for other software or third-party apps. When it comes to the set of features within Nelio Content, it’s almost like having a suite of tools all wrapped up into one. Nelio Content’s Editorial Calendar gives you a nice overview of your posts, social media messages, and content marketing tasks. And with its drag and drop interface, you can easily schedule, reschedule, and create new content directly from the calendar. Nelio Content can help you promote your posts and images through Facebook, Twitter, LinkedIn, and Pinterest. Below the WordPress post editor, Nelio Content includes a Social Media box for creating social messages. It features a timeline for creating and scheduling promotional messages to your social networks. The plugin does away with the need to visit separate social networks or use external apps to get the word out about your site’s content. And because it’s part of the post editor, you have the ability to set up your social sharing messages as you write your posts. When it comes to writing and structuring properly formatted posts, Nelio Content’s post analyzer can help with the finer details. 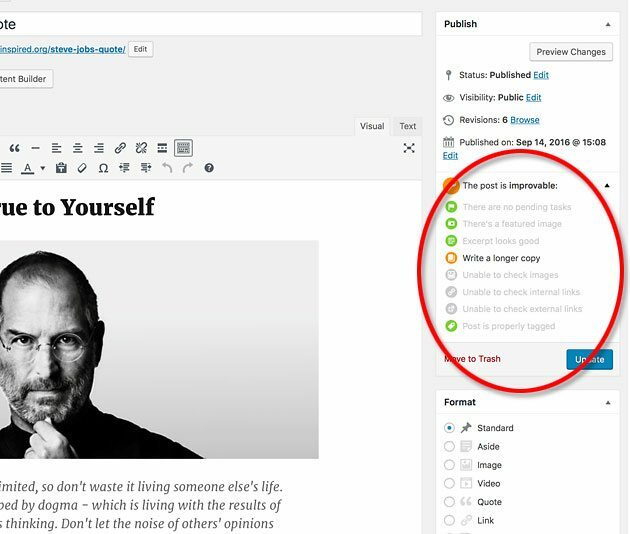 Positioned just below the WordPress Publish box, the software automatically analyzes your post content and provides guidance on tagging, images, linking, and more. The guidance you receive here can help make your writing more readable, attractive, and search-friendly. Whether you work alone or with a team, Nelio Content provides the tools that each user needs for scheduling, creating and promoting both new and old content. It makes it easy to communicate about task assignments, project deadlines, and much more. Nelio Content offers other features to help assist with your content marketing needs, such as content task organization, team editorial comments, the ability to suggest post references (e.g., links to pages or external resources), and more. 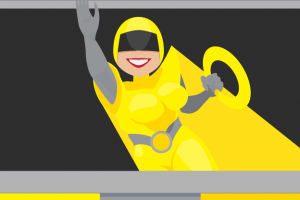 In the WordPress admin, go to Plugins… Add New. 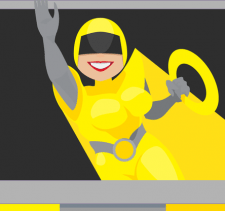 In the Search Plugins field, do a search for Nelio Content . It will be the first result returned. Click Install Now for the Nelio Content plugin, and then Activate . If you initially go the Free Version route, you can update at any time by going to the Account Details section of the plugin. There, you can click the Subscribe button to view their different paid plans. You can also choose Use license Key if you’ve already paid for a plan. If you’re subscribing to a paid plan, select the plan, fill out your payment information, and click the Pay button. After subscribing to a paid plan and completing their checkout process, you’ll receive an email from Nelio Software that includes a license key for the subscription you purchased. Note: To use Nelio Content, a WordPress user must have a user role of Administrator, Editor, Author, or Contributor. well as schedule post ideas. To schedule a task, social message, or post using the calendar, hover over the “+” icon on the day you wish to schedule the item. From left to right, the flag icon is for adding tasks, the network icon is for scheduling social messages, and the pushpin icon is for scheduling posts. Once you schedule any of these items, they can easily be rescheduled by dragging and dropping them anywhere else on the calendar. For example, to reschedule a post, simply drag it to another day. Any tasks and social messages that are related to the post will be automatically rescheduled as well. To delete an element on the calendar, just drag it to the trash. To do so, start dragging an item to the side area of the calendar, and a trash icon will appear. You can also drag an item over the Next/Previous icons to move them to another month. A simpler method would be to just click on the item and reschedule it within its dialog box. Note: If you remove some items, their related items will be automatically removed as well. For example, if you remove a post, its related editorial tasks will also be removed. You can use filters from drop-down menus to help sort what you see on the Editorial Calendar. For example, you can show or hide all posts, social messages, or tasks. This allows you to focus on the tasks and content items that are most important to you. You can also see related items for any element on the calendar by hovering over it with your mouse. For instance, by hovering over social messages within the calendar, you can see the posts they’re associated with. Go to Nelio Content’s Settings page. Click on the Social Profiles tab. To connect Nelio Content to a social network, just select the icon of the social network you wish to connect to. For example, click on the Twitter icon. To connect with Twitter, you’ll see a popup window with an Authorize app button. 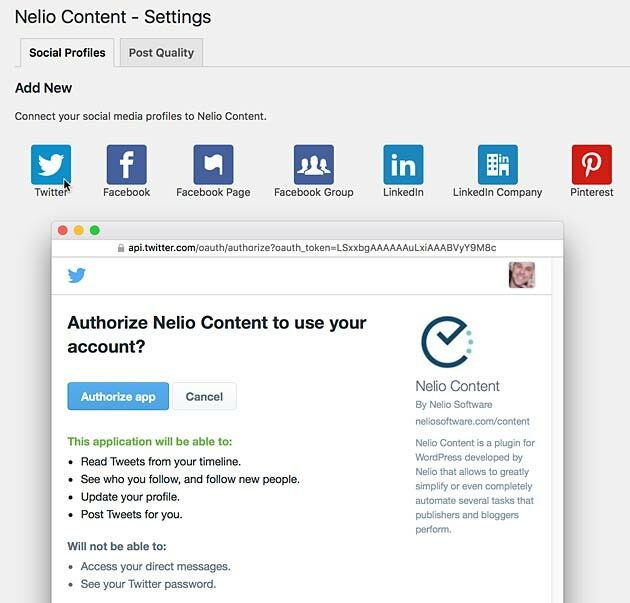 Just click that button to authorize Nelio Content to publish content to Twitter. Once you’re finished, you’ll see the new social media account in the Connected Profiles list, just below the social network icons. Any author on your team can now manage the connected social profile. After writing your content, you’ll want to promote it through social media. Nelio Content provides two ways to create social messages. You can do so in either the Social Media box below the WordPress post editor, or by clicking on the aforementioned network icon in the Editorial Calendar. The Social Media box below the WordPress post editor presents a timeline that shows all of your scheduled social messages for that post. Go to the post editor for the WordPress post you’d like to create social messages for. Scroll down below the post editor until you see the Social Media (Scheduled Messages) area. Add Social Message or Add Another. This will bring up the social media editor. Add your message, as well as a date and time for publication, and then click Save . Depending on which social profiles you connected to Nelio Content, you’ll be able to send messages to any of Facebook, Twitter, LinkedIn, or Pinterest. 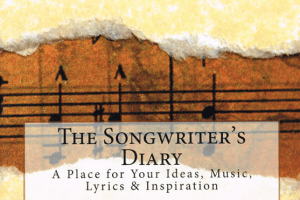 You can send out social messages on the post publication date, or anytime after that. Nelio Content provides a preview of how your social message will look. You also have the option to share messages multiple times. When you tie your social messages to the published date of your post, if you decide to reschedule your post, the related social edia messages will automatically be rescheduled to the same date and time in order to stay in sync. To create a social message from the Editorial Calendar, just click on the network icon after hovering over the “+”. This will open up the social media editor box. Add your message, select a date and time, and then click the Save button. By default, the publication date for the message is set to the calendar day you click on. Using the Editor Calendar to create social messages allows you to share old posts as well as new posts. Nelio Content provides a content assistant to help you build and structure your posts as you create them. Whenever you save or update a post, Nelio Content runs through a content analysis based on your tags, categories, images, excerpt, copy length, links, and more. And it does so automatically from within the WordPress Publish box, giving you an easy summary of any changes you might want to address. For example, if you forget to choose a featured image for your post, or forget to tag and categorize your content, Nelio Content will let you know. Nelio Content’s Team subscription plan offers features for sites that depend on a team of content contributors. The Team plan helps to manage content responsibilities with built-in task features. For example, within the Editorial Calendar and post editor, you can easily assign editorial tasks such as post writing responsibilities to different members of your editorial team. On the Editorial Calendar, click on the flag icon (after hovering over the + symbol for the day you want to assign the task). Enter a task description, assign it to a team member, and set a due date. Like other calendar items, tasks can easily be rescheduled by dragging and dropping them to another day. Nelio Content also provides an Editorial Task box on the right side of the WordPress post editor page. Editorial tasks that are created when editing a post relate to the post. The Editorial Task box shows completed, pending, and overdue tasks for the current post. Editorial tasks that are created through the Editorial Calendar are more general and not directly related to specific posts. Another team feature is Editorial Comments, a discussion area below the WordPress post editor. Editorial Comments lets team members post comments about the current post, improving ideas and communication between Administrators, Authors, and Contributors for the content they’re working on. Comments added with the Editorial Comments box remain accessible to any team member that can edit the post. And they always remain on the post page, so you can go back at any time to view them. Nelio Content includes a Links area on the right side of the post editor page for sharing Suggested References. If a team member has a link they want to share that might be beneficial to a post, they can share it here. On their website, Nelio Software offers a comprehensive guide on how to use Nelio Content . I found it to be clear, well-written, and nicely organized. They also provide a small FAQ section on the same page. You can also access their Help section directly from the WordPress admin, from within their plugin menu. Nelio Content comes at a couple of different price points, including a free version from WordPress.org that you can try out. change or cancel plans at any time. Creating relevant and interesting content for your site, and successfully promoting that content to your target audience, is a challenge that demands a lot of time and effort. Nelio Content, with its Editorial Calendar, social promotion features, post content analysis, and team communication functionality helps make that challenge much easier. Through automation and assistance, Nelio Content can help WordPress content marketers with the organization, planning, scheduling, creation, and promotion of their site’s content. It can help you plan and publish more consistently, reach a broader audience through social media, make your site more engaging, and manage a content creation team. Currently, Nelio Content is available in English, Spanish, Italian, Romanian, Korean and Catalan, with more languages to come. If you’re looking for a solution to help organize your content strategy, save you time, and make you a better content marketer, Nelio Content is definitely worth taking a good look at. It offers a lot of value for the price and is an easy-to-use program that can help take your content creation to another level. 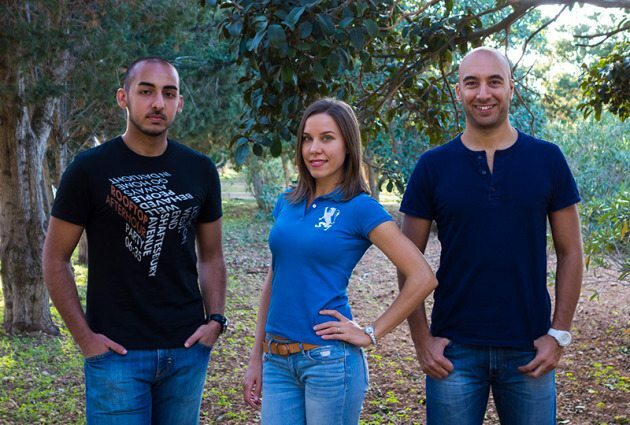 If you’d like to find out more about Nelio Content, you can check out their website here . This is an analysis that was written to provide a valuable outside perspective to the creators of this product. They paid for a 100% honest, no-holds-barred breakdown of all they are doing, both good and bad, because they want their product to be as good possible. 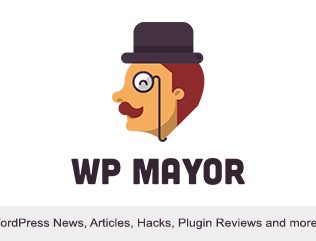 In the interests of sharing that knowledge with the larger WordPress community, we also give them the option of publishing it on WPMayor.com … but with the vital condition that the content cannot be altered or spun in any way: our readers expect and deserve the same 100% honesty. We sell thorough, no-holds-barred product studies to creators who want an outside perspective to help them evolve the best possible WordPress product. Our to-the-point expertise has helped to improve countless WordPress plugins, themes, and services, find out more about PAS – The Product Analysis Service. David is an award-winning online marketer and brand developer with a passion for WordPress. 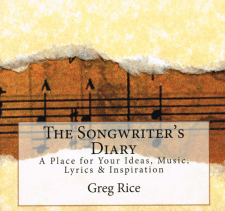 He helps individuals and organizations live inspired lives through their unique story and brand.